This week, we’ve launched the 2017 Levitt AMP Music Series website—your go-to resource for lineups, artist bios and all things Levitt AMP—and the 2017 Levitt AMP artist lineups have started rollin’ in! Check out who’ll be performing at this year’s Levitt AMP Jacksonville Music Series and be sure to stay tuned for upcoming lineup announcements for Denison, Santa Fe, Ocala and Carson City! 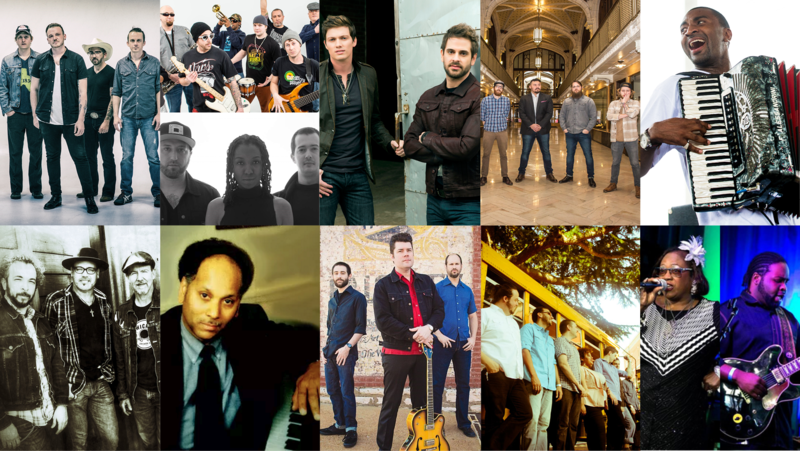 Artists pictured above (L to R, from top to bottom): Vandoliers, Unifyah and Mathias & The Pirates, Waterloo Revival, Old Salt Union, Curley Taylor, The South Austin Moonlighters, Ptah Williams, The Trip Daddy’s, Dirty Revival, and Marquise Knox ft. Renee Smith. Starting June 2 with the Vandoliers, an alt-country band with punk roots, the Levitt AMP Jacksonville Music Series will present 10 weeks of free, live music in Central Park—fueling the city’s efforts to revitalize the formerly neglected historic central business district and bringing the joy of free, live music back to Central Park. See the full lineup, featuring Dirty Revival, Curley Taylor, Marquise Knox and more. This six-piece alt-country band from Dallas-Fort Worth combine a punk DIY sensibility with country roots, creating their own unique brand of modern-day outlaw country. With opening act Smashtag at 6PM. Known for their joyous, high-energy live shows, reggae band Unifyah and hip-hip collaborative Mathias & The Pirates will have the audience up on their feet and dancing all night long. With opening band The Tangents at 6PM. This modern country duo will bring a foot-stomping good time with their irresistible hooks and catchy melodies. With opening act Poor Farm Road at 6PM. Combining traditional bluegrass with jazz improvisation, this Belleville, Ill. quintet has all-American music rooted in its DNA. With opening act St. Andrew’s Society Celtic Dancers at 6PM. Hailing from Louisiana’s Creole country and the son of zydeco legend Jude Taylor, Curley Taylor has infectious zydeco music running through his veins. With opening act Ten Foot World at 6PM. This blues rock quartet blend the best of Southern rock and soul, amassing fans around the world with their exuberant style. With opening act The Longmeyer Band at 6PM. This renowned jazz pianist who has shared the stage with several jazz greats is known for taking audiences on a rollercoaster ride with his thrilling and unpredictable style. With opening act Community Summer Band at 6PM. St. Louis’ premier rockabilly band has played with the likes of Brian Setzer and Chuck Berry, and is known for giving audiences a rollicking good time. With opening act West End Boogie at 6PM. This dynamic seven-piece soul outfit led by powerhouse vocalist Sarah Clarke is known for turning their live shows into raucous dance parties. With opening act Stone and Snow at 6PM. Soulful blues guitarist/vocalist prodigy Marquise Knox will heat up the stage with “Queen of St. Louis Soul,” Renee Smith. With opening act Pizzazz at 6PM. This entry was posted in Levitt AMP and tagged Levitt AMP Jacksonville on April 12, 2017 by Nicole McGaffey.